January 13, 2009 - In 1902, the National Zoo in Washington D.C. arranged to have a unique and endangered animal called the thylacine, or Tasmanian Tiger, brought to the United States from Tasmania. Later that year, a female and her three cubs arrived at the zoo. However, by the mid-1930s, the thylacine was extinct, leaving behind only preserved museum specimens. In a study published online today in Genome Research (www.genome.org), researchers have used state-of-the-art DNA sequencing technology to analyze preserved thylacines, including one of those brought to the National Zoo more than 100 years ago, making novel discoveries in thylacine genomics and the burgeoning field of "museomics." 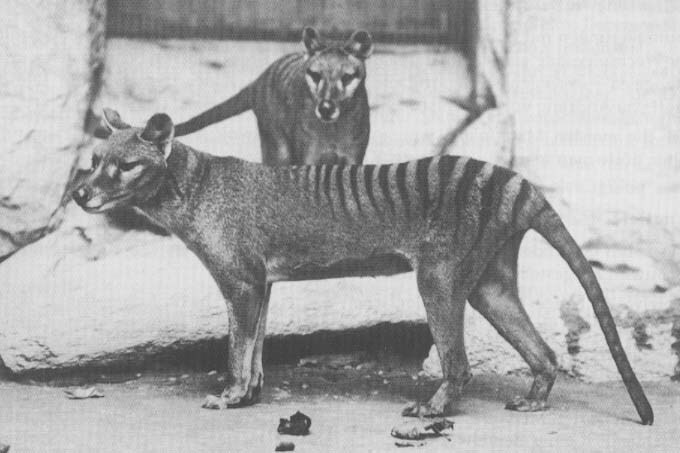 The thylacine was actually not a tiger at all, rather a marsupial with many dog-like features—a striking example of convergent evolution in mammals. Extensively hunted by farmers, the thylacine was becoming increasingly rare in the wild at the time the National Zoo acquired the female and cubs, and was declared extinct in 1936 upon the death of the last captive animal. Genetic sequences sampled from the preserved specimens of the National Zoo thyalcine family have been studied in recent years, however these investigations were severely limited by DNA contamination and degradation. Now, in a strategy nicknamed "museomics," researchers are using improved methods for sampling DNA combined with the latest sequencing technology to analyze preserved museum samples. In this study, an international team of scientists has sequenced mitochondrial and nuclear DNA from the hair of the male thylacine offspring brought to the National Zoo in 1902 and a female that died in the London Zoo in 1893. In addition to refining the place of this unusual animal in evolutionary history, genetic clues to the impending extinction of the thylacine became apparent. "What I find amazing is that the two specimens are so similar," said Dr. Anders Götherström of Uppsala University in Sweden. "There is very little genetic variation between them." Götherström, a co-author of the study, explained that a lack of genetic diversity is indicative of a species on the brink of extinction, and we are now observing this more than 70 years later. In addition to using the mitochondrial genome sequence to study the phylogeny of the thylacine, the authors also investigated the collection of genetic material of microbial and viral origin (the "metagenome") present on the museum samples. Interestingly, the research team found distinct differences in the microbial content of the hair of the wild-born thylacine from the London Zoo and the captive-born thylacine from the National Zoo. Furthermore, the authors noted that the specimens were preserved by differing methods. "Analyzing the microbial content of museum specimens will therefore allow us to gain insight into the microbial flora that lives on the exhibit samples and help to develop means to further protect them," said Dr. Stephan Schuster of Penn State University, also an author of the report. This work has established the groundwork for more detailed genetic analysis of the thylacine, opened the door to more museomic studies using the treasure trove of museum specimens worldwide, and will raise dialogue about even bigger projects. "The large amount of mitochondrial and nuclear DNA gained in our study demonstrates the feasibility of a thylacine genome project," explained Schuster. "It will also revive discussions on the possible resurrection of the animal." Scientists from Penn State University (University Park, PA), Texas A&M University (College Station, TX), the University of Copenhagen (Copenhagen, Denmark), Royal Holloway University of London (London, UK), Centro Mixto UCM-ISCIII de Evolución y Comportamiento Humanos (Madrid, Spain), the Swedish Museum of Natural History (Stockholm, Sweden), Tübingen University(Tübingen, Germany), the Smithsonian Institution (Washington, D.C.), and Uppsala University (Uppsala, Sweden) contributed to this study. This work was supported by Penn State University, the Gordon and Betty Moore Foundation, and the Pennsylvania Department of Health. Webb Miller, Ph.D. (webb@bx.psu.edu,+1-814-865-4551), Stephan Schuster, Ph.D. (scs@bx.psu.edu,+1-814-863-9278), and Anders Götherström, Ph.D. (anders.gotherstrom@ebc.uu.se,+46-(0)18-471 64 83), may be contacted for more information. Additional information about this project is available at thylacine.psu.edu. Interested reporters may obtain copies of the manuscript from Peggy Calicchia, Editorial Secretary, Genome Research (calicchi@cshl.edu;+1-516-422-4012). Miller, W., Drautz, D.I., Janecka, J.E., Lesk, A.M., Ratan, A., Tomsho, L.P., Packard, M., Zhang, Y., McClellan, L.R., Qi, J., Zhao, F., Gilbert, M.T.P., Dalén, L., Arsuaga, J.L., Ericson, P.G.P., Huson, D.H., Helgen, K.M., Murphy, W.J., Götherström, A., and Schuster, S.C. The mitochondrial genome sequence of the Tasmanian tiger (Thylacinus cynocephalus). Genome Res. doi:10.1101/gr.082628.108.